1 drawing on paper ; 5.5 x 8.5 in. 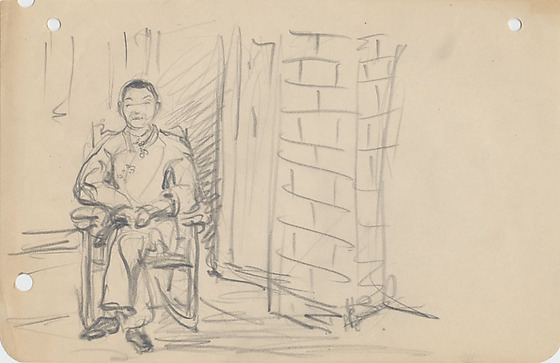 Pencil drawing of a man sitting on a rocking chair. The man has short black hair above a collared shirt and pants with elbows resting on chair arms and hands on lap; legs are crossed. A brick column is sketched in the middle of the paper; blank space on the right. Appears page was originally 8.5 x 11 in. and was then cut in half.